Palestinian story: Did the Palestinians snub Clinton at the UN rights council? 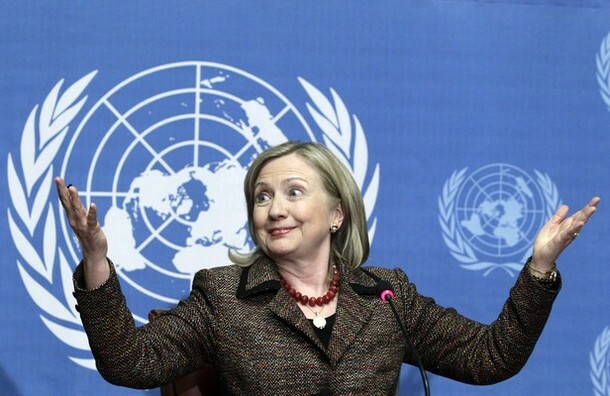 Did the Palestinians snub Clinton at the UN rights council? According to Palestinian Ma'an news agency, the Palestine delegation left the UN Rights Council session on Monday during a speech by US State Secretary Hillary Clinton. The session was overshadowed by the Libya unrest. The walkout, the agency adds, came over Clinton's criticism of the council's permanent agenda item on Israel. "We walked out in objection to Clinton's desperate defence of Israel before the other members. She said that the council targeted and singled out Israel." The incident is not clear, and there are too few reports to shed more light on what actually happened. However, it can be considered another act of posturing by the Palestinian leadership after the recent US administration's veto of a Security Council resolution on the illegality of the Israeli settlements. The veto angered the Palestinians to the extent that there were immediate calls for anti-US protests in the West Bank. A rare all-faction demonstration did take place. The Palestinian leadership, particularly Abu-Mazen, seem to have interpreted the US veto as a victory. Indeed, Abbas pushed for the vote even though he was asked not to by Obama and Clinton,r in phone calls that reportedly included threats of cuts in US aid. The other 14 Security Council members agreed on the resolution, on the other hand. Locally, in the Palestinian areas, the push for a Security Council vote has certainly given Abbas a moral boost, a breath of political air, after the collapse of the peace process and the Palestine Papers drama. It was perhaps the first time in his term that Hamas did not criticize him or his authority for their conduct . Nevertheless, this posturing seems to be still very cautious, if not timid, especially with the Geneva incident. Apparently, only the UAE news agency has so far reported it, apart from the Arabic version of Palestinian Ma'an news agency. Meanwhile, Wafa, the Palestinian Authority's own news agency, did mention the incident, either.